Take commercial grade CAD anywhere with a mobile international USB license key option. Quick and simple USB dongle ideal for sharing one progeCAD license between computers and laptops - register each computer once and plug in! One USB dongle includes serial code for installing progeCAD across multiple PCs. Each activated PC can then be used by anyone with a dongle! * This product is a full permanent license for the complete progeCAD Professional software package. The CADDIT progeCAD 2019 license will work with both 64-bit and 32-bit versions of the software. progeCAD closely emulates the AutoCAD commands and interface, including AutoLISP scripting and, most importantly, full DWG file support. License includes one month free progeSOFT TSL2 support and one year TSL1. Local Australian support is also available (choose below). This is a permanent "for business use" license with no "timeout". Broken USB dongle replacement will incur a small fee. Also please note that we do not replace lost or stolen keys. Be sure to choose included type of support or optional printed box and manual when ordering progeCAD below. 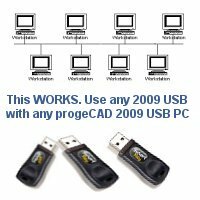 *Note USB "swapping" requires activation of like progeCAD version for each workstation and dongle used.